MAC Viva Glam Gaga lipstick - So pretty! Urban Decay 24/7 eyeliners - I'm in love with the formula and color selection. Clean & Clear Acne Spot Treatment - The only C&C product that works for me and it works well. MAC Cultureclash lipglass (Spring Colour) - Such a pretty pink that looks good alone or layered. MAC Quad 3 (Spring Colour) - I love a purple smokey eye. 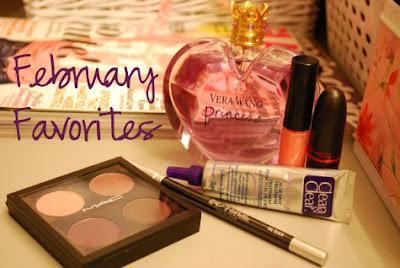 Vera Wang Princess perfume - Possibly my new favorite go-to scent! You know the drill. Feel free to share your favorites from this month! love princess too btw, i went through my whole bottle in like 2 years!